WhereToFindCare.com Blog: Why so loud in a hospital? Why so loud in a hospital? American hospitals are not always quiet at night, at least that is what the HCAPHS survey is telling us. 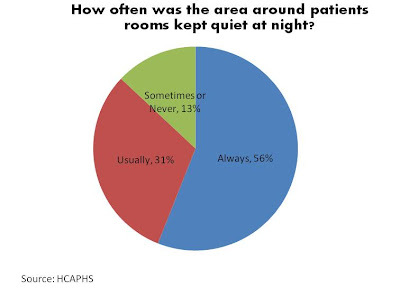 Almost half of the patients surveyed said the area around their room is not kept quiet at night. That is a problem, especially considering that rest and sleep are critical to the healing process. What kinds of noises are occurring at the area around the patient rooms at night? New patient admissions, restocking supplies, staff communications, overhead pages are just a few sounds that wake us up at the hospital. What has been your experience on noise levels at night during a hospital stay? There were extremely high noise levels nearly all the time! I went without sleep for 41 hours straight. It was horrible to be that sleep deprived on top of feeling lousy anyway. Some staff members were whistling and singing at 5 a.m. in the Cardiac ICU! I am not kidding. Why can't they understand that patients are ILL and need lots of rest? I guess that's too LOGICAL, so they can't comprehend it!